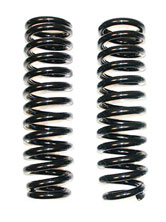 BDS Pro-Ride coil springs are designed to withstand full coil bind and bounce right back to their original height. In other words, you won't have to worry about sagging springs. All BDS coils are shot peened to increase tensile as well as hydraulically pre-set to reduce long term fatigue. The polyester based powder coating flexes with the springs to ensure long term protection.